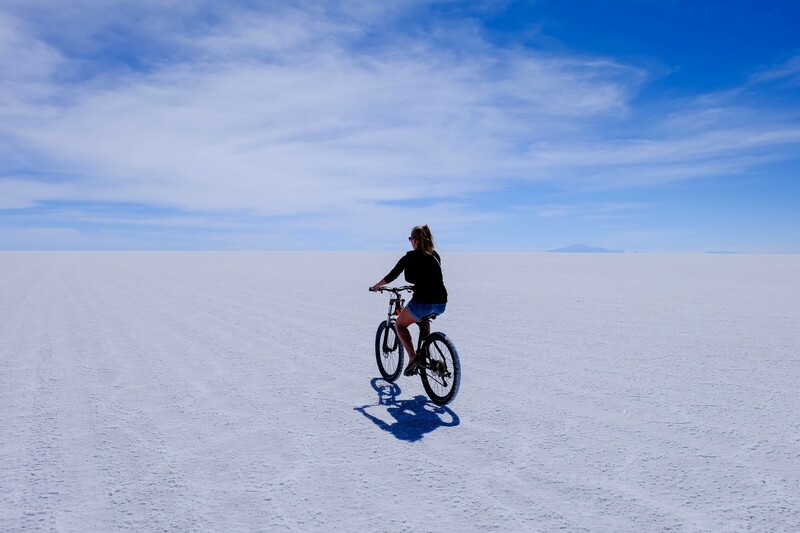 15 Photos of Salar de Uyuni to Spark Your Wanderlust » Lavi was here. 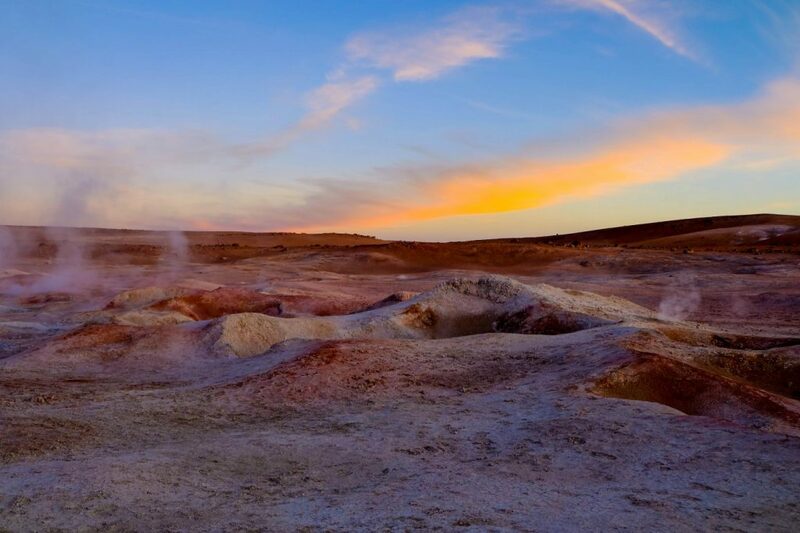 It’s no secret that Salar de Uyuni is gorgeous. 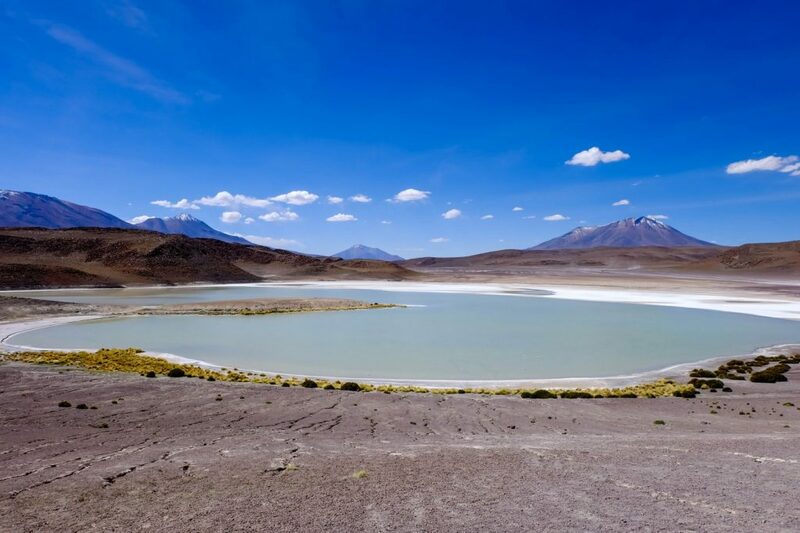 Whether it’s the salt flats themselves or the lakes, thermal pools, and volcanoes nearby, there is beauty all around the world’s largest salt flat. 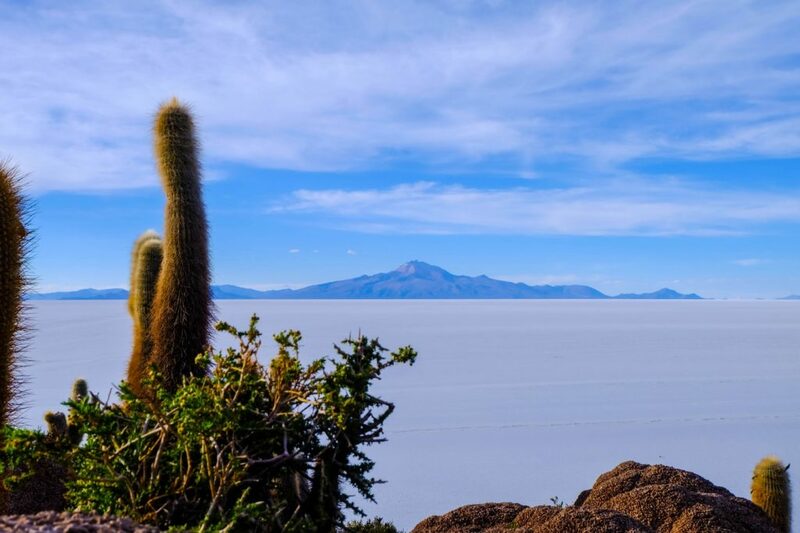 If you’re planning on visiting Bolivia – and manage to cross the border with no issues – a tour of Salar de Uyuni is a must. Don’t just take my word for it. 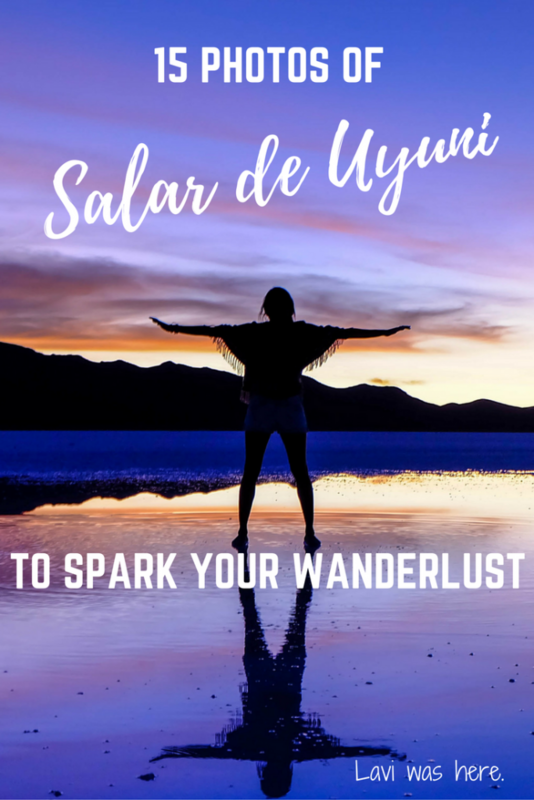 If you don’t know where to go on your next trip, here are 15 photos of Salar de Uyuni to spark your wanderlust! The salt flats are a sight to see in their own right. With nothing but a layer of white salt and some mountains as far as the eye can see, it put into perspective how small I was in this big world. Vehicles, the salt hotel, and other people looked like mirages as we biked toward what felt like a nonexistent destination. 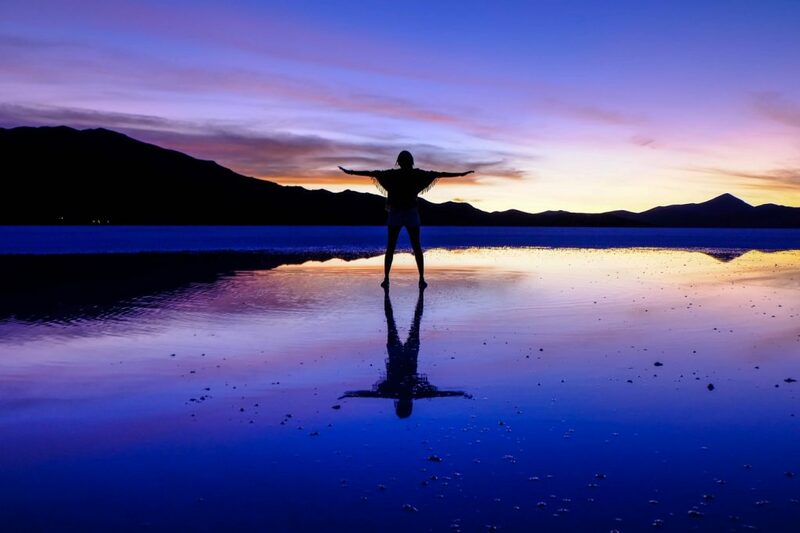 There may be other salt flats in the world, but there is nowhere like Salar de Uyuni. The cacti on Fish Island looked furry, but I wasn’t going to get too close! This island plopped in the middle of the salt flats was out of place and puzzling, but also so photogenic. It was one of those places that made me think, “Where are we?”. 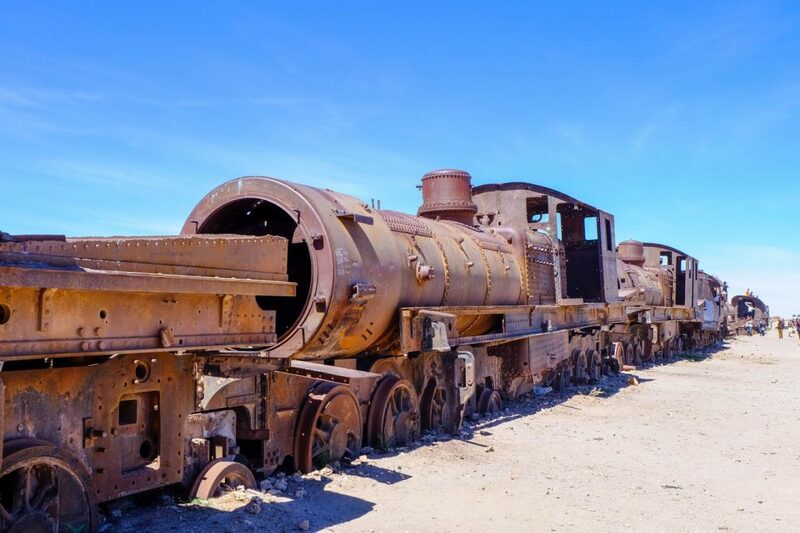 The train cemetery was one of the most interesting parts of the tour. 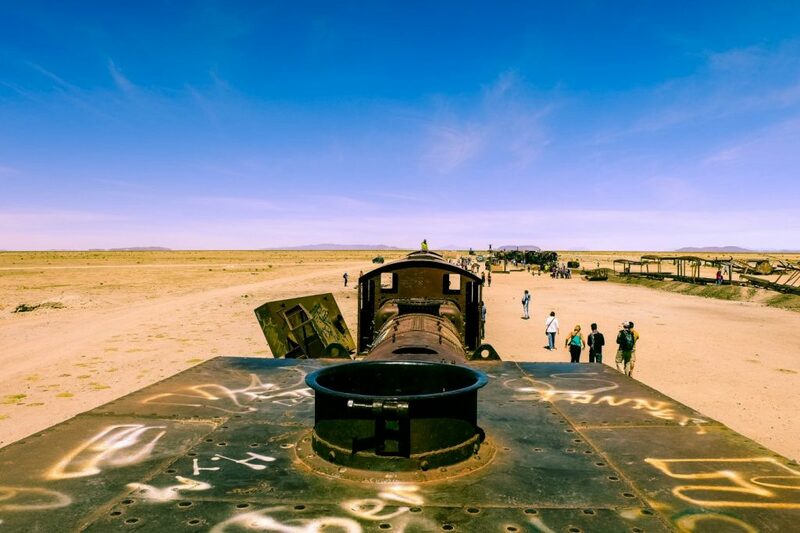 It was almost sad to see these “dead” trains in the desert, but it was fun to climb on them like they were part of a massive jungle gym! When was I ever going to be on top of a train again? I’ve seen my fair share of volcanoes up close while hiking them, but it was nice to gallivant around in the desert and gaze at this one from afar. Actually, Chile is just on the other side of it! 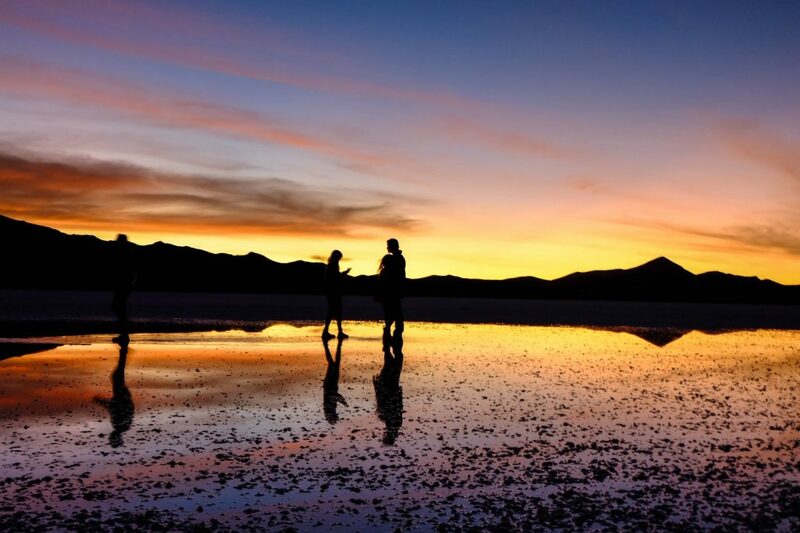 Not everyone gets to see the salt flats at sunset. I was so happy we signed up for this extra on the tour. All I wanted to do since I saw other photos was try to capture a reflection in the salt flats. The sky lit up in the most vibrant shades of blue, purple, orange and yellow as we stood in the sunset. It felt like we were the only people on earth. It was an early morning, but it was worth it. 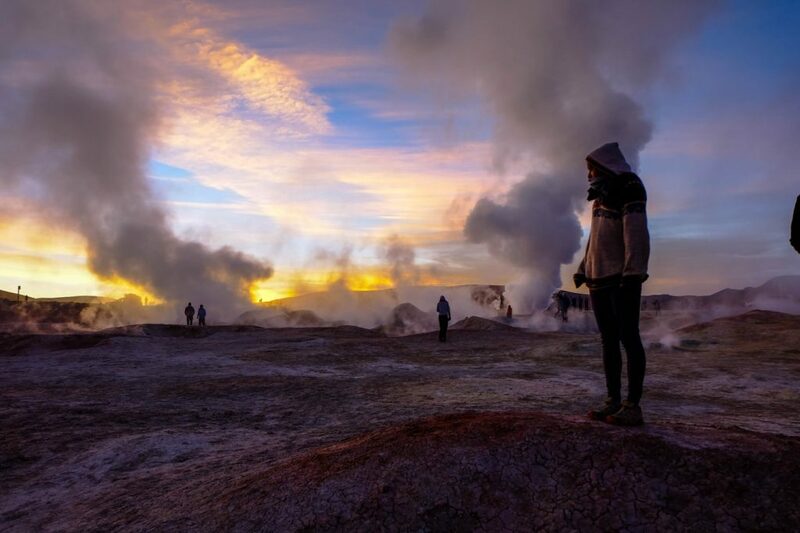 Even if the steam and bubbling pools at Sol de Mañana smelled like sulfur, this was the best way to start our last day in Salar de Uyuni. It might have been a little too cold outside for me to enjoy dipping into the hot springs, but I was so happy to capture this image. 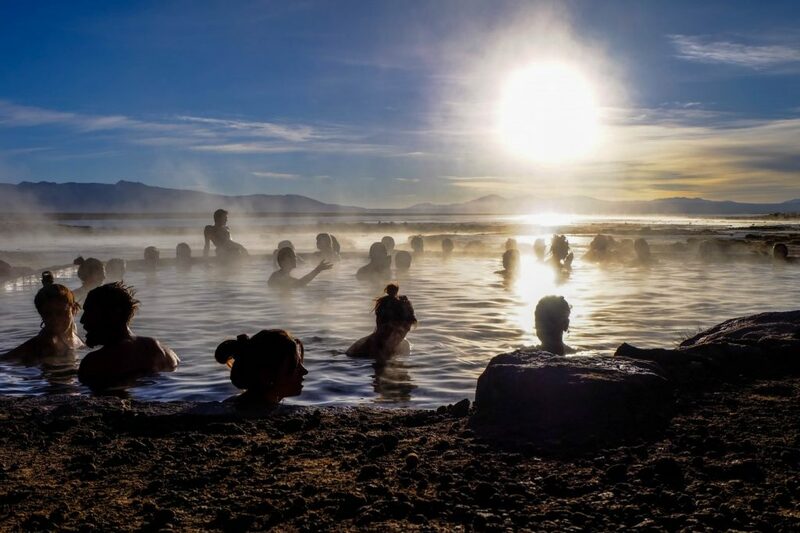 The silhouettes of other travelers simmering in the steam of the pool made me feel like I was in a dream. 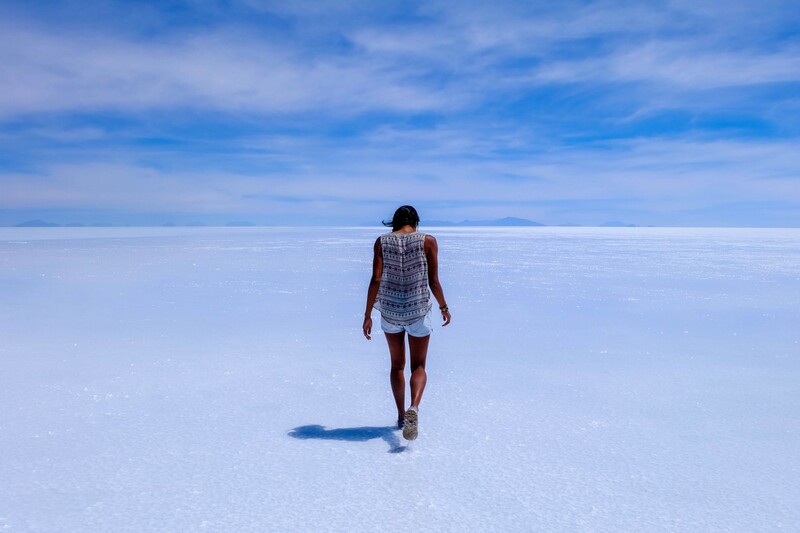 The entire salt flat experience felt like a South American dream. 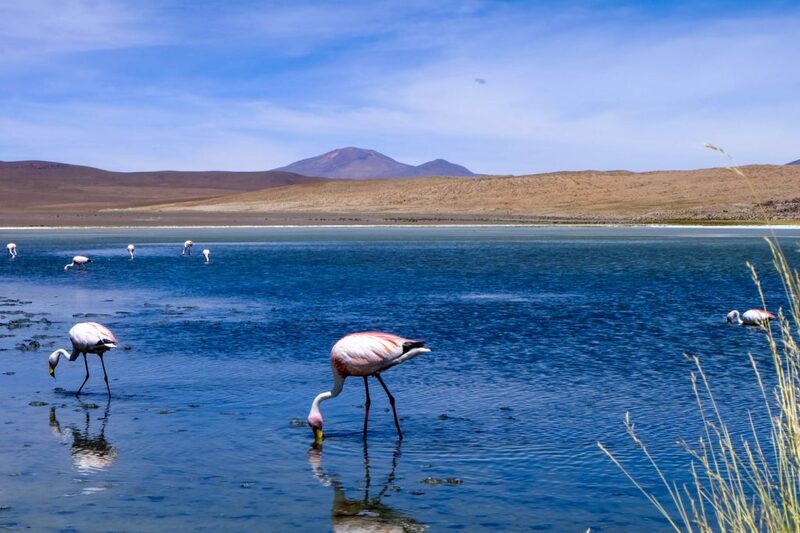 We didn’t see much wildlife in Uyuni aside from some foxes and maybe a vicuña here or there, but there were so many flamingos! 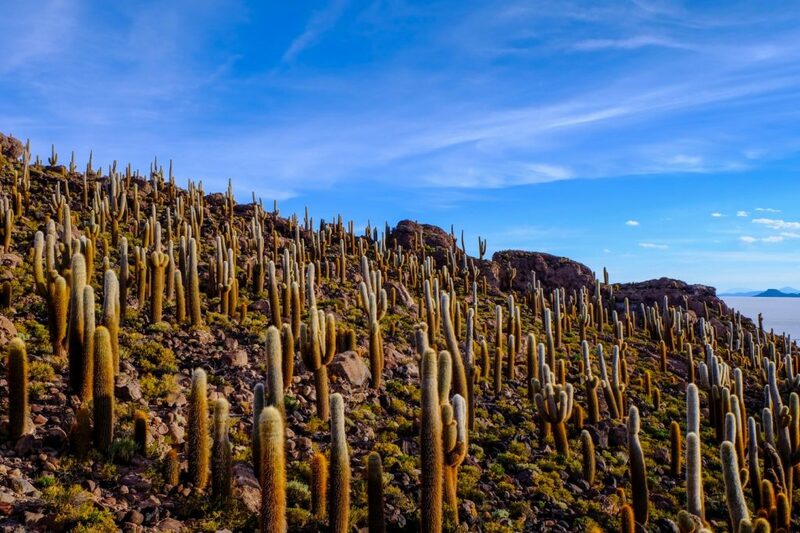 Volcanoes, lakes, salty earth – this is Salar de Uyuni in a nutshell. All photos were shot with my Fujifilm X-A2 . It’s an amazing mirrorless digital camera that I 100% recommend! I edit my photos with Adobe Lightroom and love using it. 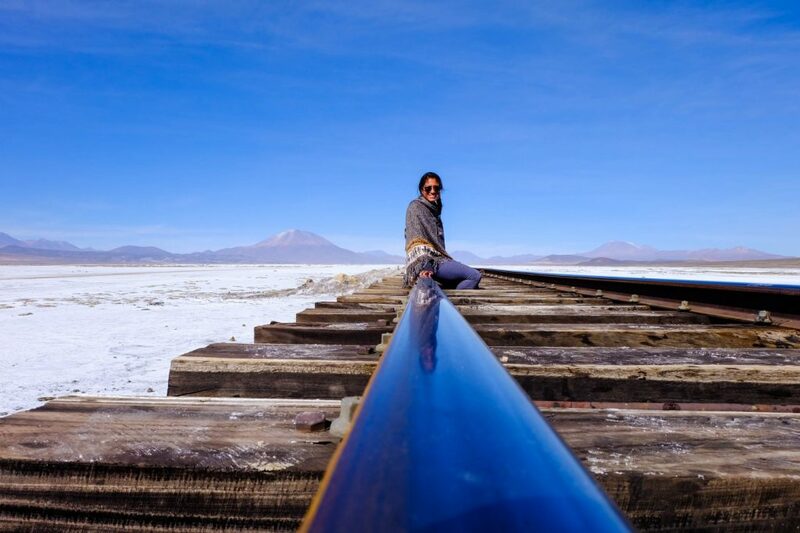 So…is Salar de Uyuni on your bucket list yet? Your ability to see the most beautiful angles and colors is remarkable! These are some of the most stunning salar de uyuni photos I’ve come across (and I’ve seen a lot)! 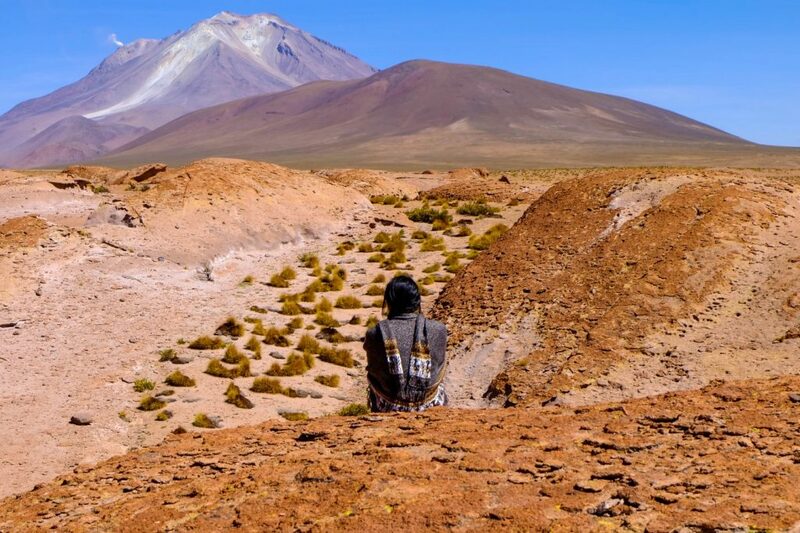 You’ll LOVE Bolivia! There’s so much more to it than what you see at first glance! Wooooow, the photos in your post makes us gonna book our tickets right now! You guys have to get there! Have you been to South America yet?